Should You Open the New Chase IHG Premier Credit Card? Chase has been in the blogs a lot lately. Changing rules (not always for the better) and offering new cards, we’ve been writing up quite a few posts on the news. 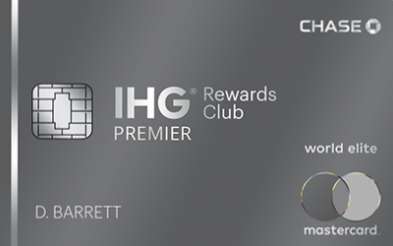 Chase and IHG have grown their partnership now to include two new credit cards. Let’s take a look at the IHG Premier card. Looks a little boring to be honest, don’t you think? Staying put for a while? Get the 4th Reward Night Free on any 4 night minimum stay booked with points. Hmmm…a lot has remained from the old IHG card. Platinum Elite status is nice, though now you’re paying $89 for it (instead of $49 with the old card). The sign-up bonus is what we’re used to seeing on the IHG card anyway. If you wait long enough, I bet the offer will go down to 60,000 points for $1,000 spend. Want to wait even longer? You might even see 100,000 IHG points for $2,000 spend. You’ve also got no foreign transaction fees, and the earning structure on gas, groceries, and restaurants remain at double points. What changed? The IHG Premier card will give you Global Entry credit (check out the comments, it looks like plenty of people still need it!). The 4th Reward Night free is new, and reminds me of SPG’s 5th night free on award stays…only better. Keep in mind though, you’re losing the 10% points bookings rebate, which is really valuable if you’re booking a lot of stays. I only stay 2-3 nights at one property typically, so the 4th night free provides virtually no benefit to my travel habits. One change for the better – 10x points on IHG stays now, instead of only 5x! No more free nights at the Intercontinental brand. You’ll also still get the free anniversary night, but it’s capped at 40,000 points. I might be the only one saying this, but a free anniversary night is still a free night, even if it’s capped at 40,000 points. I hear you – no, it’s not as good as an unrestricted free night. But let’s be real guys, we all knew that had to come to an end eventually. So, Should You Open the IHG Premier card? Yes. I think the IHG Premier card still offers a decent value. BUT, don’t rush into it. For example, I wouldn’t let this card derail my application plans if I had a certain trip to work for. I certainly wouldn’t let this card get in the way of my 5/24 slots (if I had any left). I also don’t think this is a card you’re going to hold onto for very long. The previous IHG card, with it’s unrestricted free night, was a common “hold forever” card for our community. Now you’re paying $40 more every year for less benefit. No bueno. I will say though, if you have a particular IHG property under 40,000 points that you can use the night at, maybe somewhere you visit frequently, this card still earns a sock-drawer spot. For the rest of us? This is a watered down version of the previous IHG card, with only a few interesting benefits. I’ll wait until the sign-up bonus goes up to 100,000 IHG points (fingers crossed) and sign up then. I’ll keep it for a year, get my free night, and promptly cancel the card. What are your thoughts on canceling the existing card waiting a month and signing up on the new card? I have had the IHG card for more than 24 months so I am eligible for a new bonus from Chase. But I’ve also applied for several other cards from Chase recently including the Iberia card and I don’t want to press my luck. Lastly if I canceled the existing card but I’ve already got a reservation to use the free night at an Intercontinental Hotel will that put use of that in Jeopardy at all? No one seems to see the value still to be had with this cards free annual night. Why does no one complain about Hyatt and Marriott cards which have the same free night restriction and same annual fee. I keep both those cards for the free nights because even if they aren’t top hotels they are still definitely worth more than the annual fee. Same goods for this new one. When will my old card become invalid ?